Brushed Nickel Anchor Cork Screw Bottle Opener 6"
Solid Brass Single Pulley Key Chain 5"
Rustic Red Whitewashed Cast Iron Lobster Bottle Opener 6"
Antique Brass Captains Desk Compass with Rosewood Box 4"
Rustic Gold Deluxe Cast Iron Anchor Bottle Opener 6"
Red Whitewashed Cast Iron Wall Mounted Lobster Bottle Opener 6"
Rustic Dark Blue Cast Iron Arching Mermaid Bottle Opener 6"
Rustic Dark Blue Whitewashed Cast Iron Wall Mounted Decorative Octopus Hooks 7"
Red Whitewashed Cast Iron Ship Wheel Bottle Opener 3.75"
Rustic Silver Cast Iron Wrench Bottle Opener 7"
Antique Copper Starfish Key Chain 5"
The Hampton Nautical Brushed Nickel Anchor Cork Screw Bottle Opener 6" perfectly accents any nautical themed kitchen. 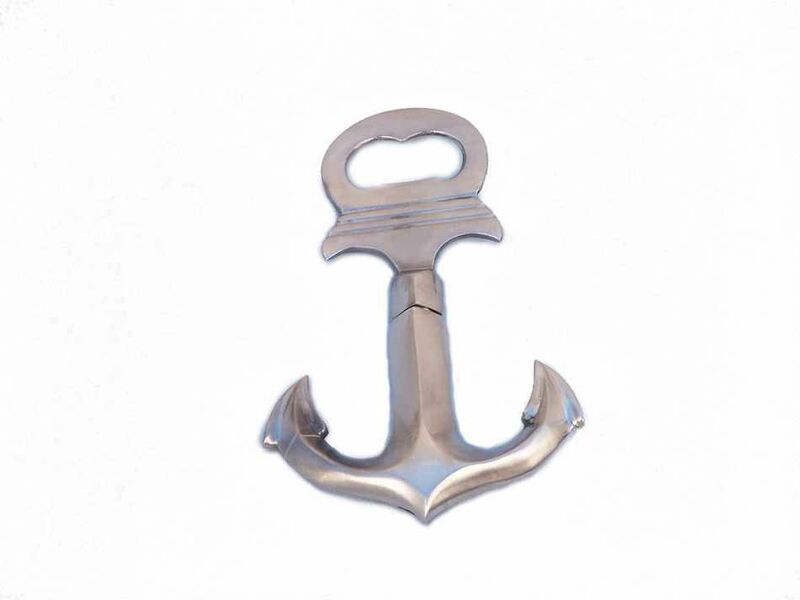 Along with its stylish matte complexion, this heavy, brushed nickel bottle opener will open even the most difficult of bottles with ease. Simply turn the bottom of the opener to reveal the cork screw and use this to open your favorite bottle of wine.